When it comes to dog training we could all use a little help. Our top training tips will help you to turn your Cocker Spaniel into a well-behaved pooch. Why Should I Give My Dog Training? Dog training helps us to bond with our Cockers. Bearing all of the above in mind, doesn't it make sense to begin training our pets as early as we can? Dog Training Should Be Fun! Training should be fun, for both you and your Cocker Spaniel, so keep it light. Keep his training sessions short but frequent. Don't drag it out - 15 minutes or less per session should be about right. Another reason for keeping your dog's training short is that Cockers have the attention span of a dead fish and easily become bored. Quit while you're ahead. End your Cocker's training session on a high before either one of you gets tired, bored or frustrated. I subscribe to the principle of positive dog training which is reward-based. In a nutshell, when your dog does something you like, you should reward him. If he does something you don't like, he should never be rewarded. 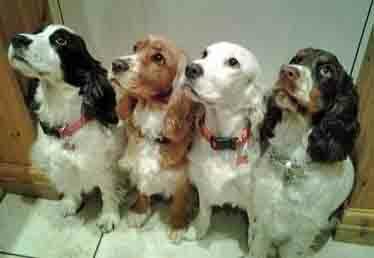 Rewarding your dog's good behaviour within a couple of seconds of it happening will help your Spaniel to link his behaviour with his reward. It needs to be clear why you rewarded him in order for him to learn to repeat the behaviour. Leaving it any longer than a few seconds could mean that he doesn't make the connection. Dogs live in the present, the 'here and now'. If your dog indulges in behaviour you don't like, (don't they all?) simply ignore him. Don't shout at him, don't look at him, and don't distract him with a treat (these are all rewards in your dog's eyes.) If you do, he's likely to begin repeating this unwanted behaviour to get more treats or attention from you. By teaching your dog to understand what you want from him, and praise him when he gets it right, his attention is directed away from unwanted behaviour. Your Cocker Spaniel will soon learn the difference between being rewarded for good behaviour (which he'll continue to repeat because he gets a treat, a cuddle, warm praise, or some other reward) and not being rewarded for other behaviours (which you want to discourage). Guess which behaviours he's going to repeat? When the penny drops and your Cocker realises that fun things happy to him when he behaves the way you want him to, he becomes motivated to repeat those (good) behaviours. When he doesn't get a reaction from you he'll soon stop repeating that behaviour simply because it's no fun! It's not always necessary to reward your dog with treats, especially if you don't want to end up with a fat Cocker Spaniel. There are many alternatives that you can use, such as your voice, cuddles, praise, a few minutes of play, etc. These are all treats to your dog. It's okay to reprimand your dog occasionally, (and indeed it may be necessary) but it shouldn't become the norm. If your Cocker is always being shouted at, your reprimands will become so diluted that he will ignore them. By all means, teach your Cocker Spaniel the word 'No' and 'Off' and use them occasionally, but it's always better and easier to let your dog know what type of behaviour you want from him by rewarding him for his good behaviour. I don't need to say that you should never hit your dog, do I? It's sad that some dog owners still believe in using this sort of 'punishment'. Unfortunately, all it does is cause more behavioural problems. Even worse, it can create a submissive, fearful dog, who, at best, acts shy or submissive around humans or, at worst, displays fear aggression. You should Be consistent about the type of behaviour you reward and those you ignore. The same applies to the timing of your dog's reward. It's important to give the reward within a second or two of his good behaviour. If you don't have a treat handy, you can say 'Gooooood Boooooy' really enthusiastically. In your dog's eyes, that's a treat. First and foremost, training should be fun! Be consistent with your training and the timing of your rewards and your dog will soon learn what you want from him. Training your dog well will give him good manners and teach him how to behave around humans and other dogs. Dog's who are well-trained are often well-behaved. As a result, they get to go out more with the family because they're such a joy to have around.